Wallis, David, Carson & Coil, P.C., P.O. Box 28, Jefferson City, MO 65102, phone: 573-636-2177, email: David.w. @carsoncoil.com, Practice Areas: Criminal, Civil Litigation-Plaintiff. Fennessey, Shea, Ford, Parshall & Baker, LLC, 3210 Bluff Creek Drive, Columbia, MO 65201, phone: 573-449-2613, email: sfennessey@fpb-law.com, Practice Area: Civil Litigation-Defense. Shea graduated from the University of Missouri-Columbia School of Law in 2017. Shea worked at the Missouri Attorney General’s Office in the Litigation Division. Shea currently works at Ford, Parshall and Baker LLC where she concentrates on general insurance defense litigation. Decree of Adoption Cases-Effective May 1, 2019, on Adoption cases filed with the court, the $30 fee for the Missouri Department of Health, to get an amended birth certificate, will no longer be collected as part of the filing fees/court costs. Effective May 1, 2019 for any new adoption case filed, it will be up to the petitioner to obtain their own amended birth certification. Upon disposition of the case, the circuit clerk will provide the petitioner with a certificate of decree of adoption. The petitioner can take the decree of adoption to the Bureau of Vital Records to apply for and receive an amended birth certificate. The filing fees will be updated through an Administrative Order before the effective date of May 1, 2019. Former BCBA Vice President, Jill Jackson, of Ford, Parshall & Baker, LLC, began her term as 2019 BCBA President yesterday, January 1, along with the following officers and Executive Committee members: Vice President – Randall Johnston, of – Randall B. Johnson, P.C. ; Secretary – Molly Metza, of Harper, Evans, Wade & Netemeyer; Treasurer – Dan Beckett, of Smith Lewis, P.C. The remainder of the 2019 Executive Committee will consist of Jason Simmons as Immediate Past-President, Jennifer Rodewald and Hon. David Zerrer, and Thad Taylor as Newsletter Editor. The Boone County Circuit Clerk’s Office is very proud to celebrate two employees for years of service. Toni Kardon is the Civil Division Supervisor and is celebrating 20 years. Toni has held this position since January of 2017, however, before that she was in the Family Court Division for 18 years and 4 years of that was in the supervisory position. Gina Wiswall will be celebrating 25 years of service with the Boone County Circuit Clerk’s Office in February 2019. All 25 years of Gina’s tenure has been in the Civil Division which has included supervising. She has a vast knowledge of civil procedures and case management. Thank you, Toni and Gina, for your outstanding dedication, enthusiasm, cooperation and hard work throughout your years of service. Dues become payable January 1, and members will be removed from the rolls if they have not paid dues by April 1, 2019. Dues are waived for members who have reached 75 years of age or have been licensed for 50 years. Please provide the 2019 Boone County Bar Association Dues Payment/Waiver Form with your payment or exemption. This is especially important if you would like your areas of practice listed with your name in the Membership Directory. On the form, each attorney may list up to two areas of practice. The form can be found at https://boonecountybar.org/dues/. The City of Columbia will host a free Fair Housing and Lending Seminar on Friday, April 5, 2019. The program features expert presentations on fair housing and lending laws, affordable housing, and the community land trust. The event also includes a building inclusive community workshop. Participants can meet city staff and explore programs the city offers for improving housing and home ownership, increasing energy efficiency and sustainability, and strengthening neighborhoods and our community. Event sponsors include Columbia Board of Realtors, Columbia Apartment Association, Central Bank of Boone County, the Missouri Commission on Human Rights, the Columbia Housing Authority, and the City of Columbia’s Human Rights and Disabilities Commissions. Sessions have been approved by the Missouri Bar for 6.3 continuing education credits for real estate professionals and attorneys. For more information and to register, go to: www.como.gov and search “Fair Housing”. The University of Missouri-Columbia School of Law invites applications for the position of Assistant Dean for Admissions and Financial Aid. Review of applications will begin immediately and continue until a suitable candidate is hired. The Assistant Dean is responsible for developing and executing a comprehensive recruitment and admissions plan to attract and matriculate an outstanding and diverse class of first-year law students and oversee and direct the financial aid office of the School of Law. Reporting directly to the Dean of the School of Law, the Assistant Dean is a key member of the law school’s senior administrative team and is expected to participate on appropriate committees at the School of Law and the university as well as external associations to learn and remain informed of best practices, standards, and trends in the law school recruiting and admissions market. The Boone County Bar Association is seeking members to volunteer a few hours of their time on Saturday, March 2nd to prepare basic estate planning documents (simple will, living will, healthcare directive and/or financial power of attorney) for Active Service Members and Military Veterans, and their spouses, free of charge. No previous estate planning experience is necessary as attorney will be trained on how to use a simple computer program that will draft the documents. This estate planning clinic will take place on March 2nd at the Truman VA in its 2nd Floor Auditorium. The Service Members and Veterans will be served by appointment only. It is anticipated that each appointment will take 45 minutes to an hour. Service Members who are deployed overseas will attend their appointment via Skype or FaceTime, but those appointments will be handled by attorneys comfortable in communicating by video conference services. Attorneys are asked to volunteer a half-day of time toward this worthy event. There is a great need among local Active Service Members and Veterans for these legal services. Please contact Jill Jackson via email here if you would like to volunteer to help with the Military Estate Planning Clinic on March 2nd or if you have any questions. The Office of Chief Disciplinary Counsel seeks a full-time attorney licensed in Missouri. OCDC investigates and litigates complaints of attorney misconduct. We are looking for someone with three years’ experience with proven writing, litigation, computer, and investigative skills. Knowledge of Rules of Professional Conduct is necessary. The position is located in Jefferson City. Limited in-state travel. Salary commensurate with qualifications. Send resume with salary history, three professional references and writing sample by February 15, 2019, to OCDC, 3327 American Avenue, Jefferson City, MO 65109. EEO Employer. Birch, Dustin, Stange Law Firm, LLC, 1506 Chapel Hill Road, Suite H, Columbia MO, 65203, phone: 573-303-0595, email: Dustin@stangelawfirm.com, Practice Area: Family Law. Panik, Matthew, Missouri Chamber of Commerce, 7504 Wellford Ct., Columbia, MO 65203, phone: 440-506-0336, email: mpanik@mochamber.com, Practice Area: Government. Schauffler, Drew, A.W. Smith Law Firm, 2100 West Broadway, Columbia, MO 65203, phone: 573-777-333, email: dschauffler@awsmithlaw.com , Practice Area: Civil Litigation-Plaintiff. Faddis, Clifford B., Attorney at Law, 5616 Bower Lane, Columbia, MO 65201, phone:314-503-5244, email: clifffaddis@gmail.com, Practice Area: Criminal Defense, Employment and Labor. Cliff has a daughter and father that graduated from Mizzou. Cliff attended Mizzou in 1966. He served in the army from 1966 to 1969. Cliff is trained in mediation, neutral evaluation and is a panel attorney for the Missouri state public defender. Cliff has been practicing since 1974 after graduating from St. Louis U Law School. Cliff was a small real estate development owner 1978 to 1994. Cliff represented plaintiffs in employment law issues from 1994 to 2005. Cliff was a Senior Vice President for Human Resource Director for a Berkshire Hathaway subsidiary, 2006 to 2015, and HR director for the 21st Circuit Court, 2015 to 2018. Cliff is new to Columbia and lives on the Old Hawthorne grounds. The law office of Rogers Ehrhardt is pleased to welcome Josh Devine back to the firm as a Principal. Josh rejoins Rogers Ehrhardt after serving most of 2018 as the Associate Circuit Judge for Division 11 in Boone County, where he presided over hundreds of civil and criminal cases. Prior to joining the bench, Josh handled civil cases at every stage of the litigations process for Rogers Ehrhardt, and was selected to the Missouri/Kansas Super Lawyers Magazine Rising Stars list from 2014 to 2017. He was recently named to the 2019 Class of 20 Under 40 by Columbia Business Times. Irene Karns, a pro bono attorney for Mid-Missouri Legal Services and a member of the BCBA, recently was selected by the Legal Services Corporation of Washington, D.C. to receive a LSC Pro Bono Award. 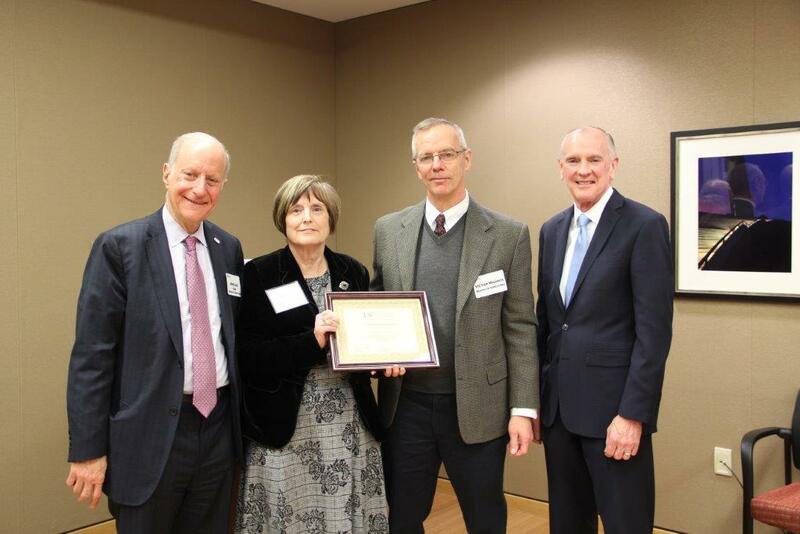 Irene was honored at a Pro Bono Awards Reception on Thursday, January 17, 2019 at Stinson Leonard Street LLP in St. Louis. Irene Karns is a retired public defender who has volunteered in MMLS’s Uncontested Divorce Clinic (UDC) for seven years. She has assisted more than 80 clients at the MMLS Columbia office since the Clinic’s inception. The UDC was created by Columbia attorney Brian Taylor, and Irene Karns has been instrumental in expanding and staffing the Clinic. The UDC is one of the most successful family law clinics in the country, with 90% of participating litigants successfully obtaining their decrees. A photo of the award presentation can be seen by clicking here pictured in photo from left to right: John Levi, Esq., Chicago, Illinois, Chairman of the Board of Directors of the Legal Services Corporation, Irene Karns, Esq., Columbia, MO, Victor Maddock of Louisville, Ky, Member of the Board of Directors of the Legal Services Corporation, Jim Sandman of Washington, D.C., Executive Director of the Legal Services Corporation. Roark, John, Smith Lewis LLP, 111 S. Ninth Street, Suite 200, Columbia MO, 65205, phone: 573-443-3141, email: Nroark@smithlewis.com, Practice Area: Civil Litigation-Defense, General Practice. Meyer, Anthony, Missouri Supreme Court, 207 West High Street, Jefferson City, MO 65101, phone: 573-751-8018, email: anthony.meyer@courts.mo.gov, Practice Area: Government, Judicial Law Clerk. Anthony graduated from the University of Missouri Columbia with his JD in 2018. Anthony presently is a law clerk for the Honorable Paul C. Wilson of the Supreme Court of Missouri. Anthony has also accepted a position with Lear Werts, LLP in Columbia and will begin employment once he completes his clerkship. The next scheduled event for Boone County Bar Association members will be the regular BCBA meeting, Wednesday, January 9. Our Speaker for the January 9th meeting will be Dave Knight and he will present on the history of legal practice in Boone County. The CLE program has been approved for 1.2 hours of CLE credits. Lunch will begin at 11:30 a.m. the Broadway Hotel, 1111 E. Broadway. The presentation will begin about noon. A business meeting will precede the program. Lunch will be $14, with checks made out to BCBA. There is metered parking available in the covered lot next to the hotel. RSVP: To reserve your spot for this meeting, click on the RSVP button on the Boone County Bar’s website home page, or use this link: https://boonecountybar.org/rsvp/ by 4:30 P.M., Friday, January 4. If you RSVP for the lunch and do not attend, you will be expected to pay the ticket price anyway because the BCBA will have be charged based on the number of reservations. Distinguished Professional Award– Presented to a BCBA member in practice 15 or more years who exemplifies the highest legal and ethical standards to which all legal professionals should strive. The Distinguished Professional Award was presented to: Marvin E. “Bunky” Wright, University Counsel Emeritus for the University of Missouri. Outstanding Service Award– Presented to a BCBA member who has made significant contributions to the benefit of the legal profession, the justice system, and/or our community. The Outstanding Service Award was presented: Steve Scott, of the Scott Law Firm, P.C. Steve Scott has uploaded some great photos of the event, which can be viewed on the BCBA website at https://boonecountybar.org/photos/. The City of Columbia is accepting applications for an Assistant City Counselor in the Law Department. This position will serve as the Assistant City Prosecutor in the City Prosecutor’s Office. Duties will include reviewing, investigating, filing charges and prosecuting municipal ordinance violations. Duties may also include handling administrative hearings and other city civil matters. Occasional evening work may be required. Possession of a Juris Doctorate from an accredited law school and a valid license to practice law in Missouri is required. Minimum three years of experience is required; experience in public sector law is highly preferred. For a complete job description and application go to www.gocomojobs.com before January 11, 2019. Family Law Committee will be holding a lunchtime CLE on Thursday, January 10 from 12-1:15. It will be held in the conference room on 4th floor of the Courthouse. The topic is Lawyers and Therapists Working Together Effectively for Children’s Best Interests. This will be a roundtable discussion with a number of local therapists and will focus on therapist records, testimony, and communication with attorneys and the Court. CLE credit of 1.2 hours is pending approval with the Missouri Bar. RSVPs are required due to limited space; please RSVP to Gretchen Yancey via email by Tuesday, January 8, 2019. There is no cost to attend however there will be pizza ordered and if you want to eat, please bring $5 to contribute (and indicate that you plan to eat when you RSVP so that we can order the right amount of pizza). During the CLE, there will be a time for pre-approved Q&A so if you have a question to pose to the therapist panel, please also send it with your RSVP to Gretchen. Columbia College and the Board of Advocates at the University of Missouri-Columbia Law School will host the Mid-Missouri Mock Trial Invitational tournament on Friday, January 25 through Sunday January 27, 2019. We began hosting AMTA events in 1999 and we look forward to our 21st year of hosting. This is a four round, three-day tournament which is limited to 28 teams. The tournament hosts need attorneys to serve as Judges for this four round Tournament, which serves as a competitive forum for teams to earn bids to the National Championship tournament. Judges will score a printed ballot with established criteria and rule on evidentiary objections governed by an evidence code similar to the Federal Rules of Evidence. Round 1 – Friday, January 25, beginning at 6:00 p.m. Round 2 – Saturday, January 26, beginning at 9:00 a.m. Round 3 – Saturday, January 26, beginning at 2:00 p.m. Round 4 – Sunday, January 26, beginning at 9:30 a.m.
Food and ample non- alcoholic beverages will be provided. Those interested in judging or in need of further information may contact Professor Barry Langford at Columbia College via email [brlangford@ccis.edu] or call (573-875-7484). Further information about intercollegiate Mock trial may be obtained at http://www.collegemocktrial.org. Lawyers and firms wishing to expense 2019 BCBA dues in 2018 may send $50/lawyer dues to Treasurer Dan Beckett at Boone County Bar Association, 705 E. Walnut, Columbia, MO 65201. Make checks payable to “Boone County Bar Association.” Dues become payable January 1, and members will be removed from the rolls if they have not paid dues by April 1, 2019. Dues are waived for members who have reached 75 years of age or have been licensed for 50 years. Please provide the 2019 Boone County Bar Association Dues Payment/Waiver Form with your payment or exemption. This is especially important if you would like your areas of practice listed with your name in the Membership Directory. On the form, each attorney may list up to two areas of practice. The form can be found at https://boonecountybar.org/dues/.